In 2012 , Southern Nazarene University transitioned into NCAA Division II. From then on, the team has struggled with winning games consistently. At the start of each season, the spotlight is on the team and coaches to see if they can turn that around. Well, the past two weekends they did just that. They have proven that they are capable of wining and put on two good games. On September 9th, they played East Central and won 33-30. 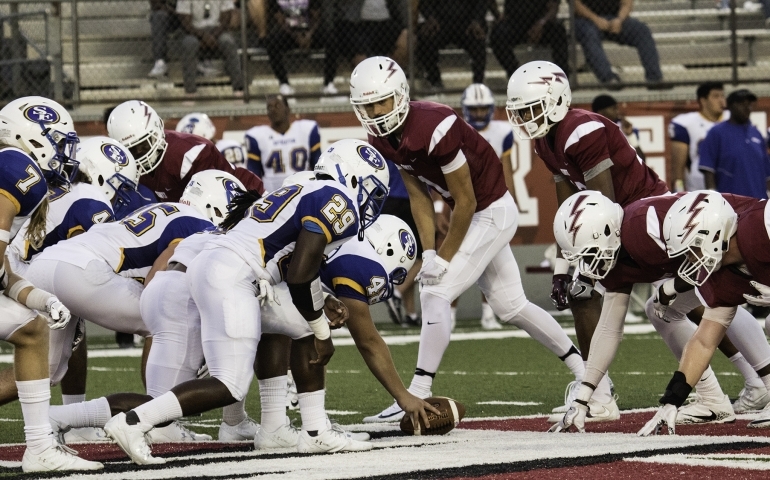 On September 16th, they won against Harding with a final score of 27-26. Anthony Bryant, a senior defensive end on the team described the emotions of that night saying, “he felt overall joyful to finally have a little bit of success.” As I am sure, the majority of players were feeling the same way. This is Southern Nazarene University’s first set of back-to-back wins since switching divisions, so it was a pretty big deal. Being a student here at SNU, it is definitely exciting to get to say that your school’s football team is winning. Often times, the football team is underappreciated and given a hard time for not having a winning record. Now that they do have a winning record and have won the back to back games, I would assume the pressure is even higher than before. Bryant mentioned that he believes the pressure and talk about getting the win from the students will come later in the week. As of now they are still excited from the wins and look forward to the tough game that lies ahead this weekend. The question now is this: can they do a replay of the past weekends and get a win here at home? Join us to find out and show the team that we are proud of the progress they are making. Next Saturday on September 23rd at 1:00pm the Crimson Storm take on the undefeated Arkansas Tech.